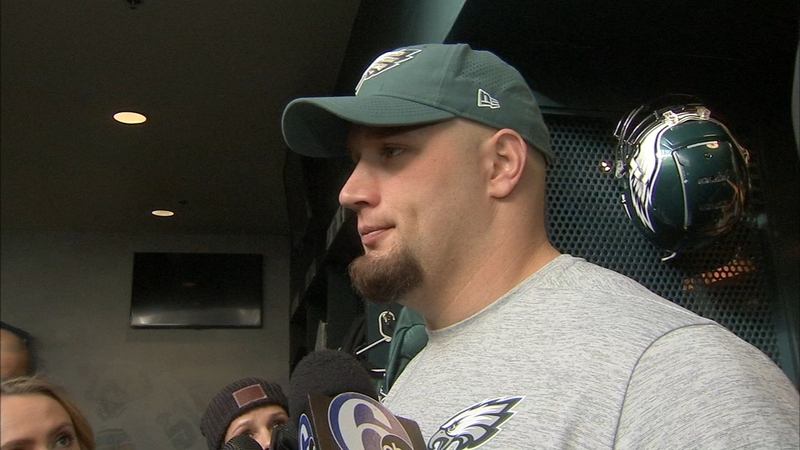 Right tackle Lane Johnson has noticed the disrespect for weeks, ever since quarterback Carson Wentz was lost for the season. He's fine with it, too, unless his Eagles are being treated like they are the winless Cleveland Browns. The Eagles (13-3) are underdogs at home to the Atlanta Falcons (10-6) on Saturday. They are the first top seed in NFL history to enter its opening playoff game as an underdog. "I'd rather be picked not to win than win," Johnson said Tuesday. He later added: "I think everybody perceives us as being the weakest and that is fine. I think that is good. I think if teams want to overlook us, that is good. We'll just see about Saturday. ... We're excited. We know what people are saying." The bandwagon had some jumpers when Wentz suffered a knee injury last month in a win over the Los Angeles Rams. It wasn't long after that when Johnson took offense and declared a media boycott that ultimately didn't last long. "What bothered me was we were 12-2 [at the time] and treated like we were the Browns," Johnson said. "It happens, but I think although we don't like it, it's a good motivator to have people not write good things. I think it's the best motivator there is and you can go and change it." Johnson is expected to spend most of Saturday matched against Atlanta's Vic Beasley. The Falcons pass-rusher had 15.5 sacks last year and 5.0 this season. He's just another opponent for the Eagles' All-Pro right tackle, who said he reached the point where he doesn't fear any opponent a couple years ago. Johnson faced some of the league's top pass-rushers this season, including Khalil Mack, Von Miller and Ryan Kerrigan. "All the guys that I played over my career, especially this year going against the best, who else am I going to see? Godzilla out there?" Johnson said. "I've seen every pass-rusher. It's not like there is an unknown out there. So always confident. I'm confident but respect every guy I go against." Johnson has earned respect. He seems to understand why the Eagles haven't done the same and are being overlooked in this year's playoffs. It's nothing new to the players in the locker room. "I feel like we've got a lot of people in this locker room who have been doubted their whole lives and have continued to prove people wrong," safety Malcolm Jenkins said. "We've done it all year, and we don't see that changing anytime soon." Johnson noted that backup quarterback Nick Foles isn't throwing for 400 yards per game, and the Eagles offense hasn't quite been the same since Wentz went down. But Johnson also believes it takes time for a quarterback to get into a rhythm. This will be Foles' fourth start since replacing Wentz, so they've had time to iron out the kinks. Johnson has liked what he has seen from some "intense" practices since the Eagles began preparations for Saturday's matchup with the Falcons. He also seems to enjoy the doubters. "I'd rather have guys doubting us," Johnson said, "than patting us on the back heading into this game."